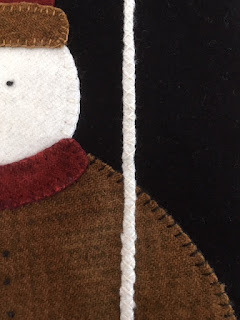 I thought I would share some of the techniques I learned while attempting to finish the wool project Silent Night-Holy Night. 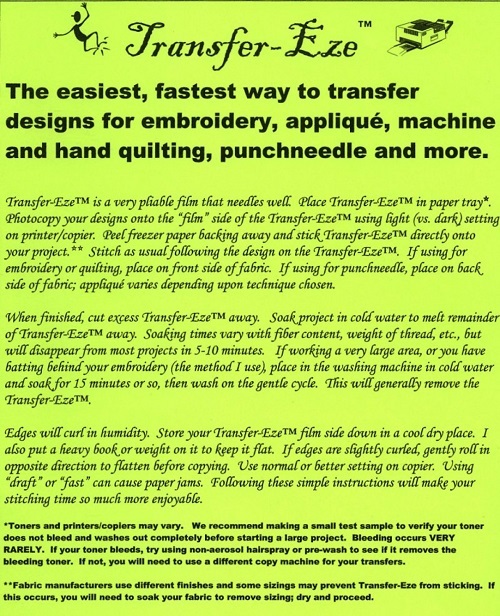 In order to stitch the word exactly as written by the pattern designer Jan Speed (It was nicely written), I used a water soluble stabilizer called Transfer-Eze. Photocopied the pattern on the sheet, stuck it on the wool piece and stitched. Once completed, I rinsed it off and let the wool piece dry. Voila! Perfect word transfer! The skinny pole (less than an 1/8 of an inch) that the snowman is holding was held back by Clover applique pins (my favourites). I worked from the front, making sure the skinny pole was straight and pinned from the back. I did an X stitch to hold it in place. There you have it, a couple of techniques for working with challenging patterns. You are a genius! I often pin from the back, and use those gorgeous pins too. But why had it never occurred to me to use x-stitch? No wonder my thin applique strips always look lumpy. 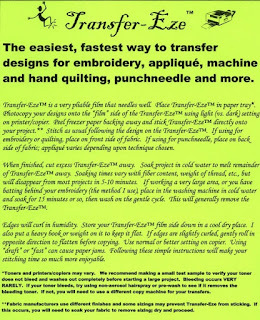 I really must get to trying that transfer method too. Maybe after I finish my Mystical Lanterns rug. I used a similar product but I didn't like how the stitching came out and it was a pain to pull out the pieces, washable sounds much easier. Rising from the UFO wool project stashes! Coming to my senses .... just a bit!